Spend your summer as a paid outdoor adventure guide. Leading groups on adventures including whitewater rafting, rock climbing, and backpacking Christian summer camps. What: We look first to graduates from last year’s summer volunteer program. If paid guide spaces remain after looking towards returning staff, we will look to new applicants that have applied seeking work with us as a paid guide. These applicants will need to successfully complete our Outdoor Adventure Guide School program. In most years, all of our paid guide needs are filled via last year’s volunteer program graduates. So we very strongly encourage paid guide applicants to seriously consider the summer volunteer program instead. Description: You will work long and hard, but very profitable and enjoyable days. As a paid guide at Rock-N-Water in California you will be directly interacting with the youth that come to our camps as you lead them through physical challenges (rafting, hiking, climbing…), mental challenges (teamwork, fears…), and spiritual challenges (campfire program, solo time, growing in your Christian faith, you personally as a role model…). You will also be responsible for some of the many other daily tasks required of the adventures we take (equipment, cooking, cleaning…). 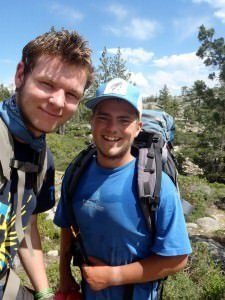 We run a Class III river, a Class IV river, top-rope rock climbing, canyon exploration hikes, a low element group building program, and a 5 day backpacking program. Who: We look for people who love God, enjoy working hard, and want to give their summer to the campers. For paid guide staff we are looking for spiritually, socially and technically mature people who are teachable, have a heart to infect youth with Christ’s love, helping people grow in their Christian faith, and have an eye for fun. Must be at least 18 years old. Pay starts at $88/per-day with food and tarp included.